1. Choose low fuss and simple dishes to make. 2. Make dishes that you’ve already made. Your old standbys are not that to others. 3. Choose a couple things that can be made the day before to lessen the work on the day of. 4. Delegate. Ask friends to bring something specific that would help you out (i.e. flowers, beverages, dessert). 5. Decide whether restaurant plating, family style or a buffet would suite your evening best or switch it up for different courses. – Gazpacho – Served restaurant style to avoid table side splashes. This can be made the day before. – Have A Chip’s – Amazing corn chips made out of Laguna Beach, CA. Make Your Own Taco Buffet – Buffet is a great way to make meals friendly for varied eating habits. Instructions for dried beans if you haven’t used these before: rinse a few times in a strainer, soak overnight, rinse, drain and store in fridge until ready to use; put in a pot with 1 part bean to 3 part water; boil, then let simmer covered for 1 ½ hours; drain most of the water, mash with a potato masher; add some salt, pepper and sautéed onion and garlic. – Raw vegan chocolate brownie balls served family style. They are a healthy indulgence that are really quick to make, require no baking, and can be made the day before, then stored in the fridge. 1. Combine all the ingredients except the coconut and cayenne in a food processor and process until smooth. 2. Roll the dough into 3/4-inch balls. 3. 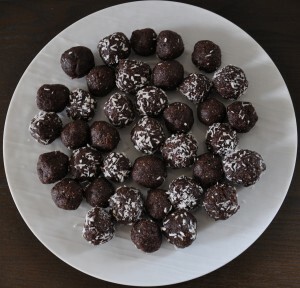 Roll 1/2 of the balls in coconut, leaving half plain chocolate. 4. With the last quarter of your batter consider mixing in some dashes of cayenne powder to make spicy chocolate balls. I made these balls smaller to differentiate them. 5. Place all the balls on a baking sheet or plate in the fridge to chill for 2 hours (or overnight and covered if pre-making).